I'm inclined to suspect the the woman with a spindle is Eve. I'm not sure what is happening in the Visconti images. Personally I think, that the Florentine sun card (aka "Charles VI" sun) with woman and spindle advertises Florentine textile industry, which made the city rich and wealthy. An association to Eve really doesn't hurt in this matter. Here is a Flemish tapestry, c. 1510-1520 ( http://www.pdl.cmu.edu/Fates/), of the three Fates. Clotho is the one who spins the thread of life. The others measure and cut. The lady at the bottom suggests that the allegory is the Triumph of Death. When Adam delved and Eve span (and none then was the gentleman), they were also fated to die, unlike in Eden. The spindle is perhaps a visual reminder of Eve's former belief that if she disobeyed God's orders she wouldn't die. Now, due to original sin, all are subject to this fate. For the connection between Eve's labor and the Sun of the Charles VI and BAR (Beaux-Arts-Rothschild) cards, there is perhaps Eccles. 1:2-3 "...vanity of vanities; all is vanity. What profit hath a man of all his labor which he taketh under the sun?" All this has nothing to do with the PMB Moon card that I can see. It does look like cords hanging from her waist, similar to the way monks are sometimes portrayed. But its odd configuration also suggests a bow, bowstring, or perhaps reins. There is also the question, whose bow? Petrarch talked, in his Triumph of Chastity, of Chastity tying up Love and breaking his bow. The engraving in Kaplan, vol. 2, p. 144, shows the pieces. 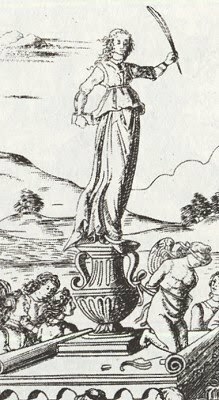 But there Chastity looks triumphant, not sad (detail below). The PMB Moon-lady might be hoklsing a broken bridle, missing the bit that goes in the animal's mouth. 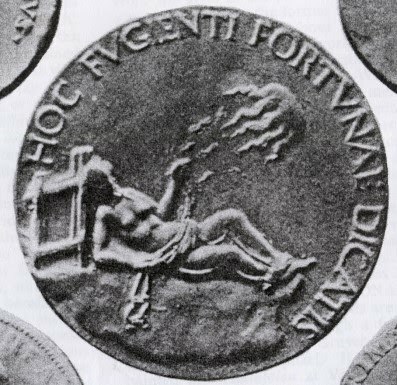 The bridle was a symbol of "chastity, temperance, or Nemesis," G. F. Hill tells us, expounding on the medal shown below, done for Elisabetta Gonzaga c. 1502, probably on the occasion of her husband's death ("Eight Italian Medals," Burlington Magazine 1909 p 215, an article that Huck drew to my attention on another thread). The closed gate behind the lady on the medal means much the same as the bridle in her hand. The virgin Diana was a goddess of chastity. Thus Elizabeth I of England was identified with Diana; and in the play attributed to Shakespeare, when the virgin Marina prayed to Diana after being sold to a brothel, the Bawd could say to her, "What have we to do with Diana?" (Pericles, 4.2). A broken bridle would mean no restraint on the instincts, i.e. a defeat for Diana. A broken bow would be similar. Reins might indicate an animal that escaped. Hence the sad face on the PMB Moon-lady's face, which I do not think reflects incompetence on the part of the artist (who, some supposed, was asked to do a card that celebrated marriage but got it wrong). Waist-strings dangling might also suggest that the Moon-lady was pregnant and hence needed a loose-fitting robe. Diana was the goddess of chastity, but just in case, she was also the goddess of childbirth. But I am just guessing. I do not think that the idea that the sad face indicates the luminaries' defeat by Eternity applies here, as the scene on the Sun card looks perfectly happy. But it could be the defeat of the present generation by the one following. Another idea: the PMB Moon card might be memorializing girls who had to surrender their virginity in marriage too early, before their bodies were large enough to handle giving birth. Marriage was even at a more mature age a risky proposition, in which women always had to be willing to give their own lives for the sake of the next generation (shown in the Sun card). We see that risk in the precipice below the Moon lady. The designer of the card (whom I imagine to have been Galeazzo Maria Sforza) might have had one particular girl in mind (also for the two cards before, Temperance and Star), notably his sister Elisabetta, married at 13 and dead at 15. Diana could offer her no protection. Thank you very much Mike. Your ideas are very valuable to me. 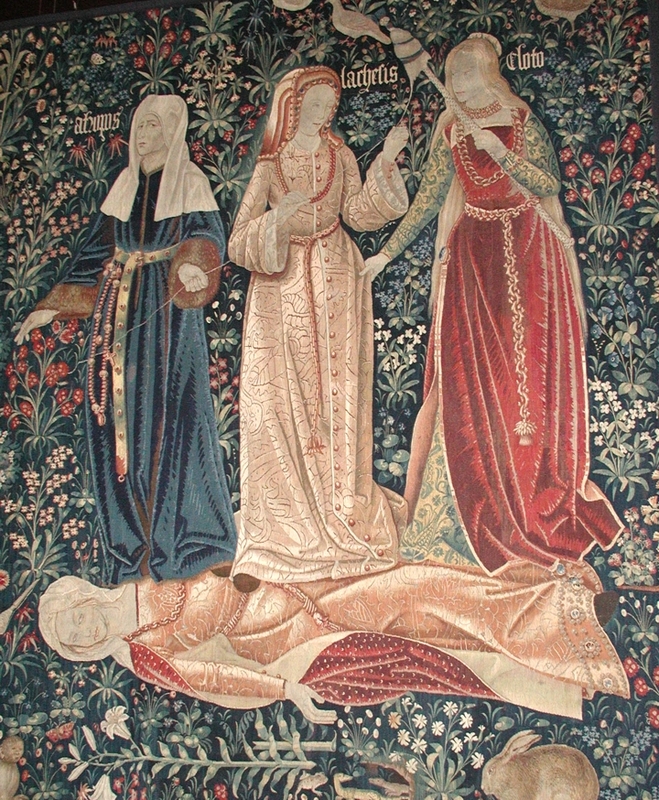 mikeh wrote: Here is a Flemish tapestry, c. 1510-1520 ( http://www.pdl.cmu.edu/Fates/), of the three Fates. Clotho is the one who spins the thread of life. The others measure and cut. The lady at the bottom suggests that the allegory is the Triumph of Death. I think it is a Fates. We have many fates in the middle age. For example, appear in the Roman de la Rose or The Chronicle of Bohemians. And always are linked to death and destinity. And we know that Macrobius speack about the fates in context astronomic (Comentary Scipio Dreams), and Macrobius its read for every people in the middle age (for example thats Sacrobosco). And I read ¿in your post on aeclactic forum? Decembrio traduced the republic of Platon. And in this bock, in the Er Miths we have the soul and cosmogony... And this idea its not contradictory with Huck idea, beacuse the images are polisemic... damned! I cant explain this in English, but, ¿you understand me? Very interesting idea. I am working about it. Sorry. I can't see a broken arc. mikeh wrote: , bowstring, or perhaps reins. I like this. Good idea for working, thanks. Yes. Its a intersting hipotesis. I am go to working about it. Thanks. Yes, I understand and agree. As in http://www-groups.dcs.st-and.ac.uk/~his ... anets.html. Here the sun is second from the top, just under the fixed stars. The Myth of Er was probably the best-known part of the Republic in the 15th century, well before Ficino's translation of the complete works in the 1480's. Macrobius, who wrote in Latin, was also well known. Since your native language isn't English, I should probably explain that in saying "When Adam delved and Eve span (and none was then the gentleman)," I was quoting a well-known English rhyme, in the version by John Ball, 1381, except that he said, "...and who was then the gentleman?" (http://en.wikipedia.org/wiki/John_Ball_(priest)). But the rhyme in some form existed before then. The connection between between Eve and spinning was part of everyday culture, and the phrase became part of English culture. Thank you very much, friend. Now I understand the strange conection with Eve. About the Moon holding her girdle, see the first decan of March, Schifanoia Palace (Ferrara). This particular fresco is attributed to Francesco del Cossa, but Antonio Cicognara has been suggested both for the non-Bembo cards in the Visconti-Sforza deck and for other frescos in the cycle of the months in Ferrara. So, the two artists are not unrelated. Fascinating - links between the two, yet both so artistically different - one could almost step down from the fresco and be accepted as a real person, able to move freely with no doubt that he was holding the end of a cord around his waist, whereas the cord in the moon card seems almost as alive as the figure.